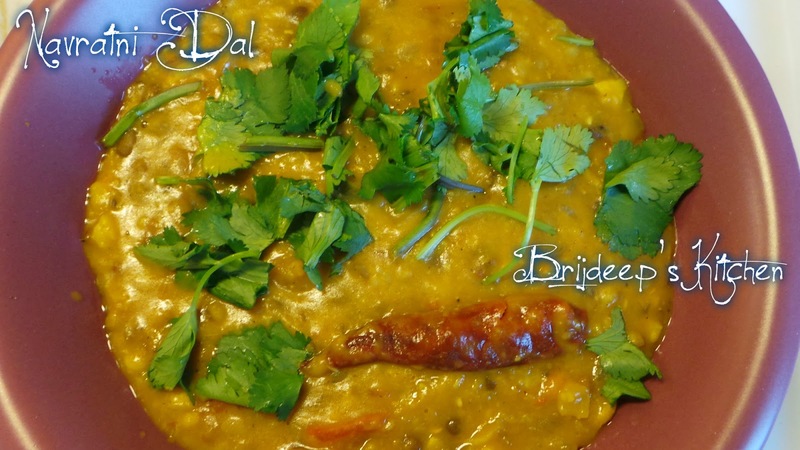 Navratni Dal is another new experiment with lentils in my kitchen. 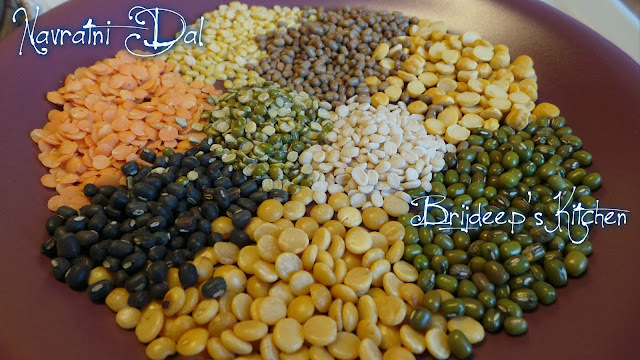 I was inspired for this experiment by an incident where a non-Indian colleague was discussing about the Indian lentils and how we prepare them, and then as we discussed about the various colors and textures of the Indian lentils, I was tempted to experiment with a mix of many lentils. Navratni dal is a mix of 9 Indian lentils which are pressure cooked together and tempered with mild spices with the usual onion-tomato. Read on the complete detailed recipe below. Black urad dal (whole): 3 tbsp. Urad dal (washed): 3 tbsp. Green moong dal (whole): 3 tbsp. 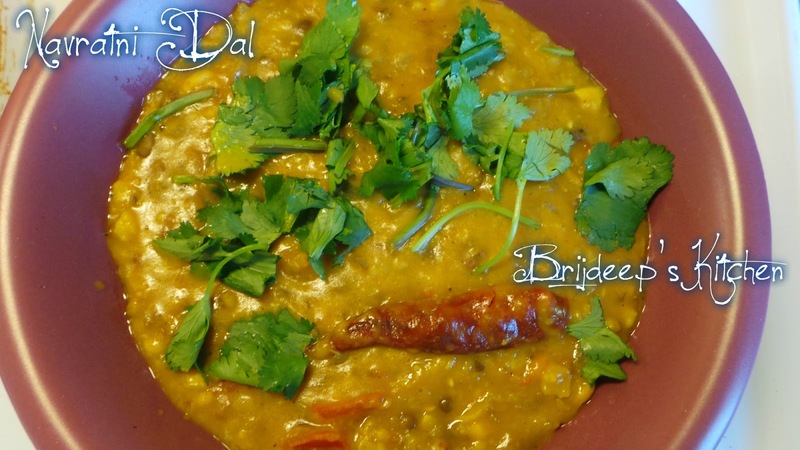 Green moong dal (broken): 3 tbsp. Soak the black urad dal, moth dal, chana dal and green moong dal together in water for about an hour. Drain the water and pressure cook all the lentils together with sufficient water and salt for 7-8 whistles. Turn off the flame and let the pressure release by itself. Heat oil in a pan and crackle the cumin seeds. Add the asafoetida and dried red chilli. Saute for a few seconds and ad the ginger-garlic paste and fry until the raw smell goes away. Add the green chilli and mix well. Add the onion and fry until they turn transparent. Add the tomato and sprinkle salt. Let cook until it becomes soft and mushy. Add the red chilli powder, coriander powder and garam masala and mix everything well. Let cook for another minute. Add the masala to the boiled dals and mix well. Add about a cup of water and mix everything well, simmer the dal for about 15 minutes. Remove from flame, garnish with coriander leaves and enjoy ! !